Are you learning Swedish? Do you want to start speaking with confidence and have real conversations? Then the Top 25 Swedish Questions You Need to Know! Audiobook is perfect for you.By the end of the book, you'll master the most common phrases and questions used in everyday conversations. You'll even be able to hold basic conversations. And if you're a complete beginner, but want to start speaking, this audiobook is the first step. What will you learn? You'll learn how to ask and answer the most common questions like...What's your name? Where are you from? How old are you? How are you?...and many more. Yes, these are the same exact questions you use and hear in everyday conversations. In every lesson, our professional, bilingual teachers explain and translate every word so that you understand it all. What makes this audiobook so powerful? Bonus "Around Town" Conversation Cheat Sheet: Learn how to get around and ask for directions, plus learn the vocab for common locations around the town. 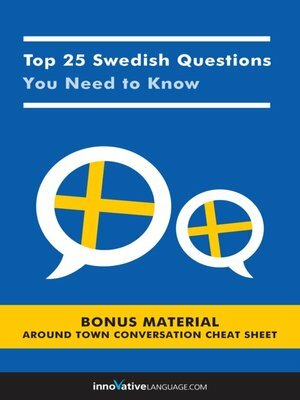 Grab your copy of Top 25 Swedish Questions You Need to Know! and start speaking in minutes.